Founded by Pellegrini’s family, Arcadia Yachts is located in Torre Annunziata, Naples, and cover a property of 36,000 square meters in the industrial area, just in front of Sorrento coast, where an important Marine Industrial Pool is based. The idea of “Arcadia” was to market a range of innovative yachts, at a time when the crisis in the industry was beginning to give its first strong signals. It was 2008 and Arcadia yachts were designed to meet the changing needs of customers following new trends, abandoning the high speed and the exuberant power in favor of moderate consumption, preferring the comfort of a relaxed sailing, thanks to functionality of the interior and exterior spaces. This new ethic concept should also have been identified through an original “brand”, which would evoke the qualities of relax and enjoyment of the environment that characterize the product. Hence the name of Arcadia which is, in the Greek mythology, a great place, in perfect harmony with nature. This charming concept is also applied to the shipyard environments: the production site and the management’s offices are two modern buildings indeed, equipped with all the necessary amenities, with a spectacular view of the of the Sorrento coast, Ischia and Capri, from which is possible to admire the new dock under construction. Arcadia marries a green approach that reflects in everything they do. The yard has managed this lifestyle to bring into the nautical sector through an idea that has combined “functional design” and “ethical sense”, to reach the best appreciation and respect for the environment. An ecological idea, which translates into ecofriendly solutions, that reduces consumption and environmental impact. All layouts are planned to give guests the pleasure of immersing in the most beautiful sceneries that nature can offer: a breath-taking view from the entire living area thanks to wide and unique panoramic windows, very comfortable sailing thanks to the special marine features of the semi-displacement hull and complete soundproofing, a true feeling of peace as the generators shut down and the sun gives its energy. An unprecedented sensation of livability provided by the distinctive design of the superstructure and the voluminous hull, which guarantees a habitability of the highest class. To enhance efficiency and simplicity, Arcadia builds highly efficient semi-displacing hulls, coupled to very light superstructures, to achieve great performances with limited power without having to go for green solutions, which are currently neither specially efficient nor convenient in terms of cost. Often enough they are highly complicated to install and to run. And what is more hybrid propulsion on a yacht of the size they produce would translate into such high costs, in comparison to the saving obtained and the very high initial costs would never be amortized. The semi-displacement hull requires limited engine power, guaranteeing low consumption, emissions and maintenance costs. Arcadia Yachts produces semiplaning yacht. Its particular hull (NPL) is named after the National Physical Laboratory of England where tests were conducted to determine the best shape hull and the best ratio length-beam in terms of hydrodynamic efficiency. Once the best NPL hull has been defined for every Arcadia model, the yard then proceeded to carry out a few changes to make it more compatible to yachts needs. This meant adding spray rails in the bow area to limit water rising up to the topsides, modifying the highly accentuated knee, which on an NPL hull is very clearly accentuated to increase stability underway. The shipyard added a stern wedge to optimize the yacht’s longitudinal trim. Every change or modification was made possible thanks to lasting experience with these types of hull. Topsides and deck are in sandwich with PVC core so as to obtain greater rigidity and to reduce actual structure which would diminish volume inside, but also to have greater efficiency in terms of insulation and sound proofing. To this end to maximize these effects, the sandwich layer along the main deck is 40 to 50 mm thick. Again thicknesses are different for what is higher up, where weight saving is very important so as not to compromise stability. For this reason, epoxies are deployed in building superstructures. The advanced semi-displacement hull which allows efficient performances together with the very light superstructure significantly reduces weight and fuel consumption and related running costs of its low-power engines. Every Arcadia model possesses its own specific hull. It is always a duly optimized NPL hull in terms of length to beam ratio, so as to obtain best hydrodynamic efficiency according to different cruising speeds. This means a different mould for each model of range. Deploying a single mould and adapting it to different lengths would have meant finding a penalizing compromise in terms of efficiency. 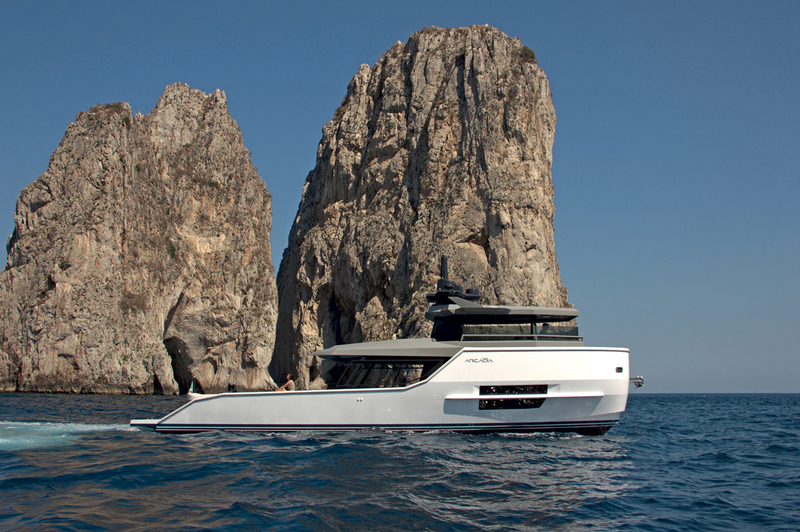 The 23.97 metre motor yacht Arcadia 85 was the first yacht to come out of this Italian based innovative yacht building company. The design reflects simple and understated styling. Her deckhouse has been made almost entirely out of double layered reflecting glass, giving the interior a bright and airy feel. The sliding over-head panels can provide privacy and shade, as required by the owner and his guests. The hull shape requires low power engines, while the solar panels are used to recharge batteries. Motor yacht A85 reflects a perfect, harmonious blend between the indoor and outdoor areas. Her aft deck is quite large for the ship of her size, and features a well protected cockpit, perfect for dining, as well as large sunbathing area towards the stern of the yacht. Four guest cabins can be found on the lower deck, including the spectacular owner’s cabin aft. The room is unusually large with a stunningly beautiful en suite head. The large VIP cabin forward is fitted with double bed. And there are also two more twin cabins. The bow of the yacht offers space for crew, which can be accessed through a hatch underneath the forward sun pads. Arcadia 85 main saloon is more intimate and provides space for up to 8 guests. However, the aft deck being well protected against the elements, gives a larger possibility to guest to spend most of the time there, instead of inside. The Arcadia 100 is built in GRP and aluminum. This model is a semi-displacement yacht with 16 knots and 18 knots respectively for cruise and top speeds. With a remarkable gross tonnage slightly under 300 GT, this unit assures volumes and amenities usually found on much larger yachts. The yard proposes many internal layout variations, either four or five cabins, to meet the requirements of the majority of owners and ensure the proper comfort and privacy expected on yachts of this size. Arcadia 100 features a new concept flying-bridge, convertible into a sheltered third-deck, completely enclosed and protected by the side windows that can be raised up electrically to meet the hard-top, exactly as it works with cars. Therefore, the whole upper-deck area becomes much more flexible and usable in any weather, being air-conditioned in very hot climes or bad weather, or left open and aired if needed, as per any traditional flying bridge. The third deck hosts the wheelhouse, a lounge with sofas and coffee tables and wet-bar, while externally, towards the stern, a sun deck. As every Arcadia model, the A100 is equipped with zero speed stabilizers, which today is the most efficient, tested and advantageous system which well suits Arcadia’s semi-displacing hulls. Thanks to her beamy, round-bilge hull, the A115 really does offer more internal volume than a typical 115-footer. From the wide-open spaces of the upper deck to the broad and bright deck saloon, the 115’s entertaining areas are spectacular, with plenty of seating and dining space. From the various layout options, the standard is a four-cabin version of the lower deck, two doubles and two twins, with the captain’s cabin behind the wheelhouse. With the spectacular full beam owner’s suite on the main deck, and four cabins down forward in the well-appointed crew’s quarters, the yacht’s full complement is 10 guests and 10 crew. The three-cabin lower deck layout features a full-beam VIP suite aft in place of the two doubles. The tender garage can accommodate a 14-foot RIB and two PWCs. A115 can accommodate four of them, with a hydraulic davit on the bow to handle the forward two. The A115’s hydrodynamics are key to the Arcadia concept, combining a broad performance envelope with fuel efficiency and sea keeping. Her semi-displacement hull form allows cruise speeds from 7 to almost 17 knots, with little change in running attitude. Loaded as we were with something like 9 tons of fuel and water, not to mention 8 tons of lead ballast in the lowest part of the hull, the 115’s progress through the water was reassuringly determined. Applying 10 degrees of helm revealed a surprisingly tight turning circle and a modest angle of outward heel, which increased as more helm was applied. Long, fixed, roll-dampening fins have also been added in front of the stabilizers. 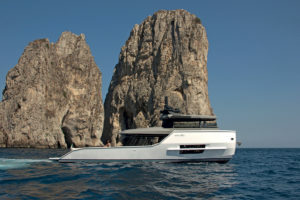 Arcadia claims that the 5-kilowatt photovoltaic panels (overall of 60 sqm) give the superstructure’s roof glass not only a futuristic look, but also provide sufficient power on a bright day to run all the appliances, without the need for a generator, which will make sitting at anchor a whole lot quieter and more environmentally friendly. There is also the option, throughout the Arcadia range, of a complete diesel-electric hybrid propulsion system.